Looking for the best maul for splitting wood? Lucky for you, so were we! We searched for days for some of the best reviewed, awesome mauls around. After compiling all the data, we chose the top ten models to show to you! We used a few important stats to help pick the best mauls for a variety of situations; here are those stats and a short explanation of each one. 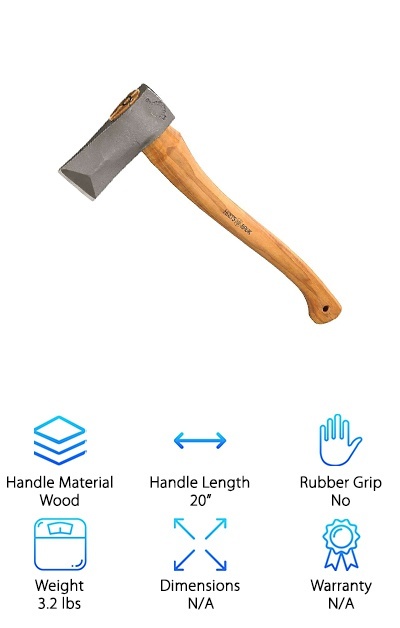 Handle Material - What sort of material is the maul handle made from? Usually, it is made from wood, metal, or very durable fiberglass. Handle Length - How long is the maul’s handle? Depending on how you split wood, you may be in need of a longer or shorter handle. 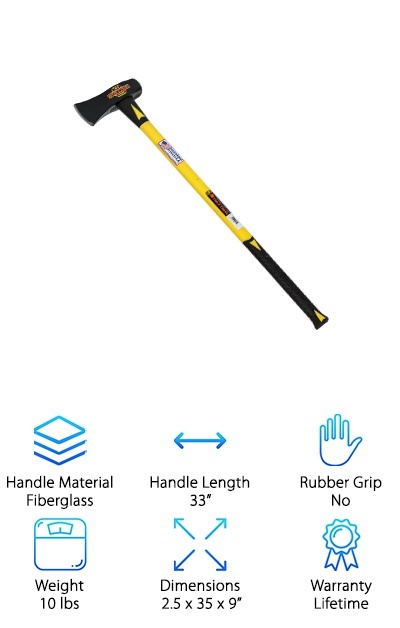 Rubber Grip - Does the maul come with a rubber handle? Rubber grips usually help you to keep a hold of your maul so it doesn’t slip. Weight - How much does it weigh? While you want a little heft, make sure the maul isn’t too heavy for you. This will be in pounds. Dimensions - How big is it? Make sure that you get the right sized tool for the job. This will be measured in inches, length x width x height. Warranty - Is the tool covered under a warranty? If so, how long is it covered? This stat will usually be measured in years or days. Now that we have all that out of the way, let’s get ready for those reviews. All ten of these mauls are awesome products; however, there were two that really stood out from the pack. That first is the Top Pick, which was our favorite of all ten. Then there is our Budget Pick, which was an awesome maul for a very low price. If you’re in a hurry, make sure to take a look at those two first! Let’s get to those splitting maul reviews! Want the world’s best splitting maul? Our pick for that is the Estwing EFF4SE Splitting Maul. It’s a beautiful, one-handed maul that is both durable and useful. This maul was forged in a single piece of American-made steel, making it both strong and stable. The blade is hand-sharpened for a perfect edge. The handle is wrapped in genuine leather to help you keep your grip while giving the maul a beautiful look. It also comes with a nylon sheath to help protect you when the maul is not in use. And the best part? The Estwing EFF4SE Splitting Maul is made in the USA, and it is proud of its American-made status. If you want a great wood-splitter and want to buy local, check out the Estwing EFF4SE Splitting Maul. Want a cheap maul with some of the best splitting maul reviews around? 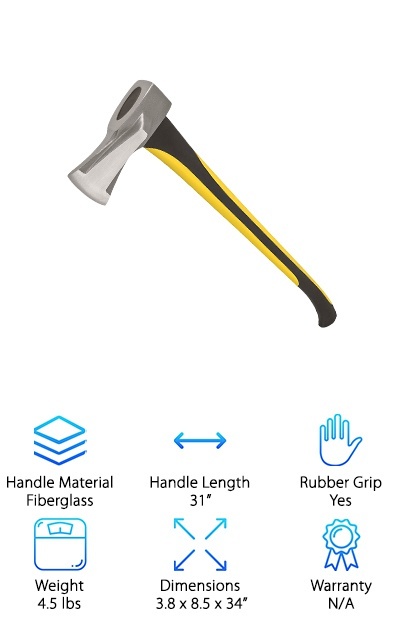 The highly-rated Tabor Tools Chopping Axe is a great place to start! This amazing axe is super inexpensive compared to most mauls, but that doesn’t stop it from packing a punch. This 12-inch maul is ready for anything you are. At only 2 pounds, the Tabor Tools Chopping Axe is great for carrying, hiking, and camping. It’s made of super durable fiberglass. It has excellent balance, making it easy to use. The blade comes with a protective rubber cover to hide the sharp edge when not in use. The blade is easy to sharpen, making this a tool you can keep around for a long time to come. All you need is a file! But the best part of this maul has to be the super comfortable handle that makes it a pleasure to handle! If you want a great maul that exceeds ASME standard B107.54M, then the Truper 32415 Splitting Maul is a great tool for you! Made from steel, this 30-inch wood splitter has the weight it takes to split wood with minimum fuss. Its bright red design makes it easy to see and hard to lose in the grass. It’s 12 pounds as has a 27-inch handle. The wider edge on the steel blade makes splitting wood easier than ever. The rubber handle helps you keep your grip. We really liked the heft of this maul; it makes chopping through piles of wood easier than many other hand tools. There’s enough room on the handle for both of your hands, but it’s not so big that you have to handle it with two hands. 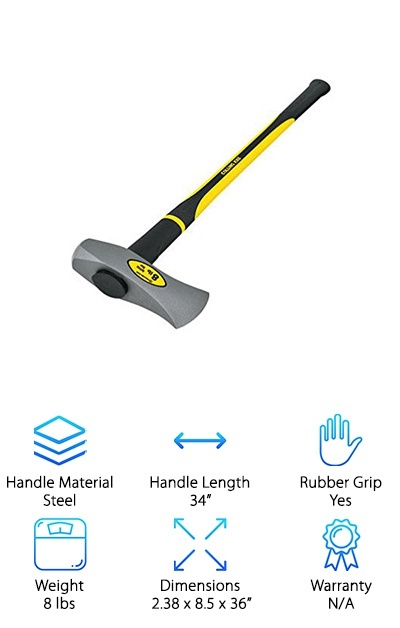 Great tool for a great price! Want something a little longer? The Fiskars Iso Core Maul has a handle that’s 32 inches long. It’s big but only weighs about 8 pounds. The angle of the blade is wide, giving you the shape you need to cut through your wood splitting chores. This amazing maul has a lifetime warranty. The maul’s handle is shaped in a comfortable, curved shape that really feels good in your hands and makes swinging just a little easier. Here’s the best part though: the IsoCore design of the maul is made to help keep shocks from reaching you. It reduces the reverb down to your body by almost half of normal, wooden handles. It really helps to cut down fatigue, soreness, and might even help with calluses. And who doesn’t want to make wood splitting just a little bit better? If you read some of the best splitting maul reviews, you’ll know that the Mintcraft PRO 34004 is a really great buy. This maul is just better at splitting wood than most of the others. It’s incredibly durable and strong with a wide, v-shaped head that makes splitting wood as easy as possible. The edge is sharp, too. 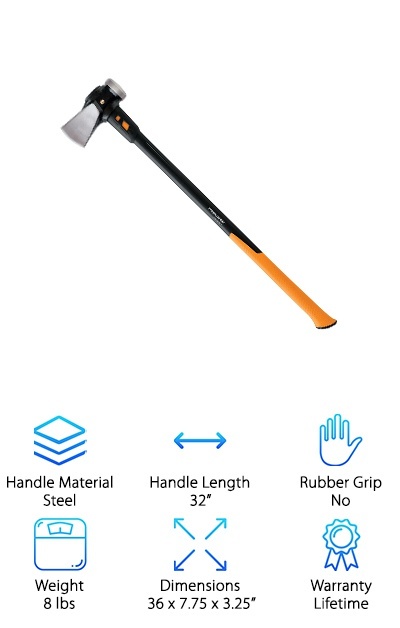 The handle is made from double-injection fiberglass that gives you overstrike protection and also is just strong for a long wood-cutting life. It’s lightweight at 4.5 pounds, but not too lightweight. The yellow-and-black handle is curved for comfort and easy to grip, making splitting as comfortable as possible. We love this maul because it’s perfect for camping; it fits easily in campers. And it’s a great price for such an awesome maul! The Collins FBG Splitting Maul is made from strong steel. The head weighs 8 pounds, lending its weight to every swing. The handle is made from durable fiberglass; it’s double injected to help fight back against overstrike. 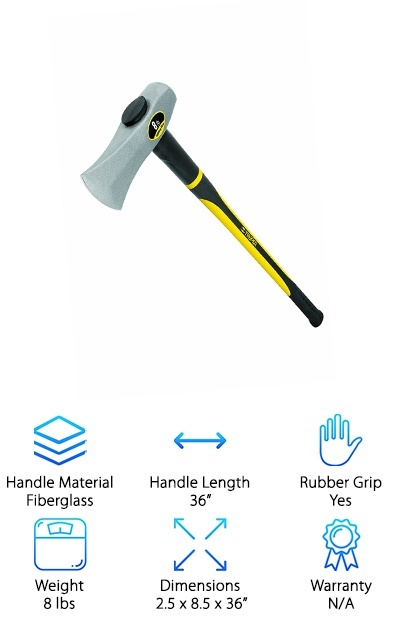 The handle is a long three feet, giving you the length you need to swing the maul and add a little more force to every cut. The yellow and black handle is rubberized to help you keep your grip. It is a very long tool, however, and it is only good for people who are comfortable swinging really large farm tools. If you are, the Collins FBG Splitting Maul is really awesome. You’ll be splitting wood like a machine! We really love this long-handled maul and would recommend it to just about anyone! 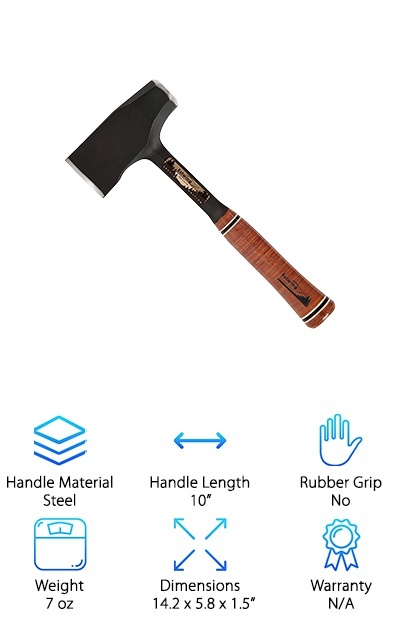 Want something with a wooden handle? The Hults Bruk Splitting Axe is tipped in a heavy steel head. The steel is struck many times, which makes it durable and strong. The head is put together in such a way that it has a tempered zone designed to keep a sharp edge even if you sharpen it a bunch. 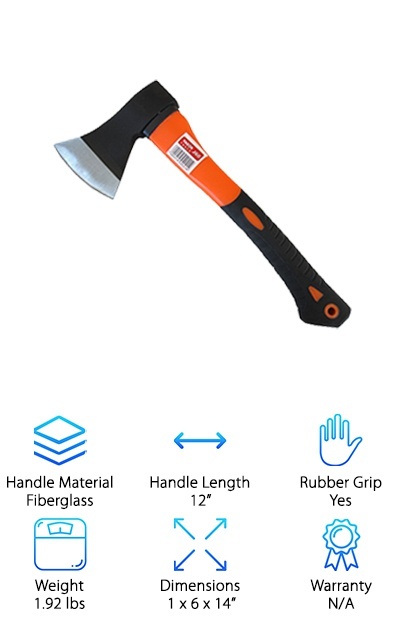 The wooden handle is sturdy and strong; it comes to 20 inches long, so it’s perfect for splitting small logs and pieces. It even comes with a protective leather sheath and a storage box to help keep both you and your new maul safe. If you are looking for a maul with a great wooden handle, the Hults Bruk Splitting Axe is a great place to look. It’s really well put together and incredibly durable; we can’t help but love it! Need a longer maul? The Seymour SM-8FG Splitting Maul is 36 inches long, making it perfect for swinging long. The motion helps to add efficiency and weight to every single swing, making sure that you need to swing as little as possible to get the results you need. This is great for splitting even large logs. It’s cleverly balanced to make swinging easy, just like a baseball bat. The blade is designed to be a wide V, making it easy to remove from wood. The grip is rubberized to help you keep your grip on it. And the best part? This maul comes with a lifetime warranty, making sure you’ll always have a quality wood splitter around when you need it. It’s incredibly easy to use and durable, making it one of our favorite wood splitting mauls ever. The Fiskars X27 Splitting Axe is a great axe for splitting wood that comes in a variety of different sizes! Each one is great for splitting different sizes of wood; it also comes in 25-inch, 23.5-inch, and 17-inch lengths. Each is designed for different sizes of wood. The 36-inch version is our favorite, though! Weighing in at eight-pounds, this thing is great for swinging at even the biggest pieces of wood. It’s designed for taller users, so if you are tall and looking for a great maul, we’d recommend this one. And it comes with an awesome, lifetime warranty too! 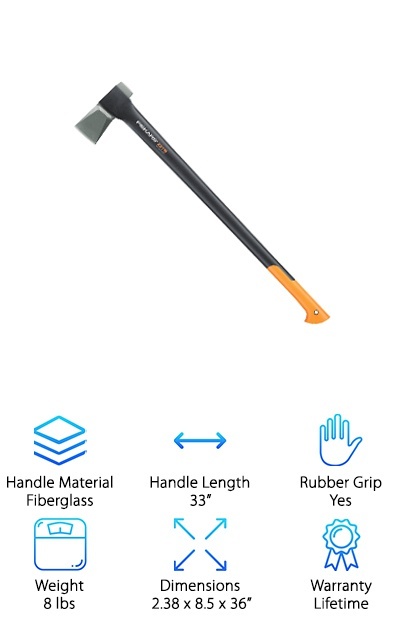 So if you are looking for a long, well-balanced, fiberglass maul with a lot of power, the Fiskars X27 Splitting Axe is a great axe to look into. The Truper 30958 Splitting Maul is 36-inches long and powerful! The handle is made from durable, double-injected fiberglass that helps to make this maul easier to handle and protect from overstrike. The head is about 8 pounds, lending its weight to each and every swing. It’s incredibly powerful with every swing. The handle is rubberized to improve your handle. The head is drop forged and has a round, bevel-edged striking face. It’s also made from quality, durable steel that really holds up. This maul also comes in a variety of sizes and handles, including a wooden version of the handle that is just as good as the fiberglass one! We really love this maul, and we’re pretty sure you’ll love it just as much as we do!